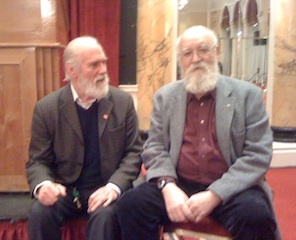 I met Dan Dennett in January. He came to Dublin to speak on the theme ‘Taking the place of religion’. A crowd of maybe four hundred turned up at some expense, and he had a warm reception. He spoke for an hour and took questions for another hour. At the question time only one speaker introduced himself as ‘a believer’, and he then admitted he hadn’t heard the talk, he had come in late just to put his question. I can’t remember what it was, but he must have been disappointed by the mild answer he got. I like Dennett’s writing, particularly his books ‘Darwin’s Dangerous Idea’ and ‘Freedom Evolves’. Although he is a professor of philosophy he refuses to write in jargon. 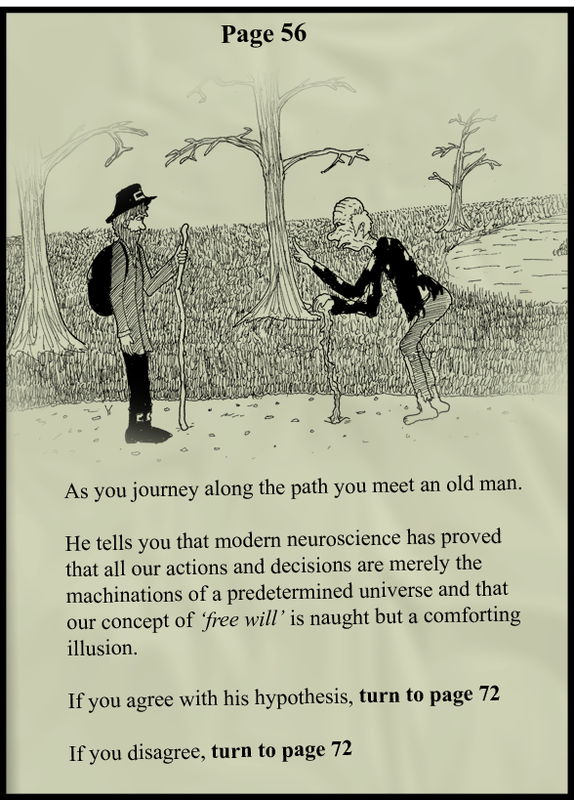 Do we have free will, or is everything that happens completely determined? An example of determinism is the rubber balls bouncing around in a lotto machine. Each ball can only go where physics dictates, according to its individual elasticity and the forces it meets. None of this is random; quantum indeterminacy (or any spontaneous quirk at all) is irrelevant; all that is required is that the bouncing is sufficiently complex to make the order the balls will end up in unpredictable in practice. So the answer? Yes, we have free will in the sense that we can and do choose things with great discrimination, but also yes, everything that happens (including our choices!) is completely determined by what went before. It’s a false dichotomy; we are freer than rubber balls because we have greatly superior elasticity, and respond to subtler forces. If you don’t find my description convincing, read the book. He replied to my email, thanking me for my poem, and also to another one I sent after booking for his Dublin event. Michael and I arrived very early for the talk, to get the best seats, and there was Dan having his cup of tea, so I sat next to him and we discussed Nabokov, an author we both admire. Very approachable and benign, he is a dead ringer for Santa Claus, even more than I am myself. The talk was interesting and very well presented, though virtually all of the content was familiar from his books, particularly ‘Breaking the Spell’. His new book comes out this month, dealing with humour. Not sure how I’ll like that; it’s OK to go dissecting religion, but humour? We’ll see. —but it seems to be a strong instinct in humans to replace rather than simply ditch such things. Religions have very strong anti-trampling routines built in; they seem to thrive well under oppression. Pruning toughens them up. One ploy the defenders of religions use is to assert that atheism is a religion. I took part in a discussion on h2g2 that invited endings to the sentence “If atheism is a religion then . . .” My best ending was “vegetarians just eat different animals”. Meditation is fine without belief, as an exercise in aligning yourself—tuning to the music of what happens. Prayer is like a bicycle helmet: it’s OK to wear one, but not a good idea to believe it will save you. But Dennett specifically does not address revisions of religion; his beef is with those who revise while pretending that they are preserving the original model, such as Pastor Rick Warren. Anyway, despite its excellence, I’m sure Dennett would be the first to admit that his idea—that TED could provide a focus for some of the good bits of religious practice, the parts that are worth preserving—is a wee bit, how should I put it, aspirational. This entry was posted on Fri 18th Mar 11 at 17:32 and is filed under Philosophy, Religion. You can follow any responses to this entry through the RSS 2.0 feed. You can leave a response, or trackback from your own site. Thanks to Gray (an ex-fellow philosophy student with me in TCD) for that. I had been led to believe that Gautama had denied all divinities himself, though I know it is not clear what he did and didn’t say. Shine Dan Dennett’s enlightening shafts. He takes it in multiple draughts. I also sent a copy to Dan the man himself, who replied “Like it.